Stuart McCall insists his side have it all to play for when they finish the season at McDiarmid Park on Sunday. The Steelmen have already confirmed their runners-up spot in the Scottish Premier League and a return to Europa League action in 2012/13. Saints, on the other hand, will go right to the wire with Inverness in the battle for third with the Highlanders facing a tough away battle against fierce rivals Ross County at Victoria Park. And although the Fir Parkers have nothing to play for on paper, the 40-times capped McCall is adamant his squad will be doing everything they can to win. “I was at a dinner on Monday night and Stevie Lomas was telling me that, as a fellow ginger, I have to look after him and play a weakened side whilst at the same time, Terry Butcher’s staff are texting me every day to say I had better not or the big man will be coming to get me,” he joked. “But in all seriousness, we have our own targets. If we can win, it will mean we will have won 19 matches; 50% of our games and that would be incredible for Motherwell. A win would also take us into double figures in terms of away wins so we’ve got a lot to play for. Motherwell Football Club are today (Friday) pleased to confirm Simon Ramsden has signed a new two-year contract at the club. RAMSDEN arrived last summer from Bradford City and has enjoyed an excellent debut season at Fir Park, forming a formidable partnership with Shaun Hutchinson at the heart of the Steelmen defence. That has been rewarded with a contract extension that will keep the former Sunderland stopper in Claret and Amber until June 2015. 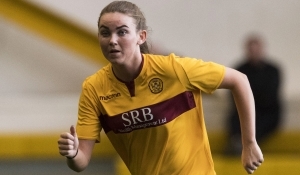 Speaking to the gathered press at Motherwell’s weekly news conference, Ramsden, who has played thirty times this campaign, said: “I am really happy to be staying at the club and pleased that the contract has been sorted out. “My family and I are really settled in Scotland and I am pleased how things have gone on the field too. “To make my debut in the Champions League, then play a part in this team finishing second in the table has been fantastic. Motherwell goalkeeper Darren Randolph has today signed a two-year deal at English Championship side Birmingham City. Randolph arrived at Fir Park in the summer of 2010 and has made a huge impact in his three years at the club. He will leave and join up with his new teammates at St Andrews on 1st July having played 136 times in Claret and Amber, keeping 46 clean sheets including a club record 19 in one season back in 2010/11. During his time in North Lanarkshire, he broke into the Republic of Ireland squad under Giovanni Trapattoni and made his debut earlier this season as a second-half substitute against Oman in London. He has represented the Steelmen in both the Europa League and the UEFA Champions League and will be rightly considered amongst Motherwell’s best ever goalkeepers. The 26-year old wanted to thank the Fir Park faithful for their backing during his spell. He said: “Following three fantastic years at Motherwell, I wanted to put on record my sincerest thanks to the staff and fans at Fir Park for their great support during my stay at the club. “With my contract due to expire at the end of the month, and after discussing my future with close friends and family, it now feels like the right time to seek a fresh challenge. “I will be taking some great memories with me and hope that I will still be welcomed back to the club in the future. I will certainly keep an eye out for Motherwell’s results next season and beyond. “When I joined the club in 2010 from Charlton Athletic, I was told on day one that I had big gloves to fill with the departure of John Ruddy, and looking back over the past three seasons, I hope the fans feel I achieved that. “As widely reported, I have decided to start a new chapter of my career down south with Birmingham City where I will be replacing another great goalkeeper in Jack Butland. “I’ll no doubt have a new set of fans to impress and that is a challenge I am very much looking forward to taking on. “Once again I can’t thank the fans enough, they’ve been great to me from my first game to my last and that is something I won’t forget. The club is in good hands moving forward and I would like to wish the board, staff and players the best of luck for next season and the years ahead. Everyone at Motherwell Football Club would like to thank Darren for his immense contribution during his three years at Fir Park and wish him every success at his new club next season.